CANflight - Stock Flight Systems - Designed to fly. 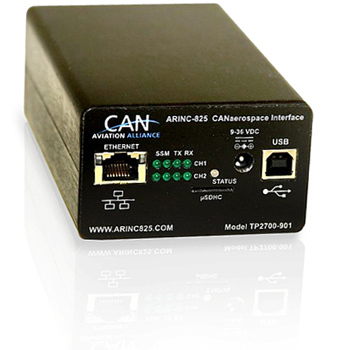 The CANflight adapter is a CANaerospace Protocol Compliant Network Interface providing a 1000/100/10 BaseT Ethernet interface for communication with the connected Rotax® 912iS Engine Control Unit (ECU). Because each CANflight adapter communicates over Ethernet with it’s host, multiple CANflight adapters may be connected using a simple Ethernet switch if more channels are desired on one platform. CANflight includes the powerful eXtended CAN Tool (XCT) software for Windows, MacOS, and Linux. Each CANflight Adapter is a small handheld, USB powered, intelligent adapter that is powered from either a USB port or from a 9-36VDC Aircraft or Aircraft power source. The adapter provides two electrically isolated fully independent CAN 2.0B Interfaces and is implemented in a Xilinx FPGA and contains two internal CPUs. The CAN 2.0B interfaces are implemented with licensed Bosch C_CAN controller IP cores to ensure compatibility with the ISO 11898 CAN standard and to allow precise hardware timing and control over the transmission and reception of CANaerospace messages. The Xilinx FPGAs and the CANflight firmware provide local buffering and 60ns time stamp resolution for all CAN messages and implement CANaerospace specific protocol functions including data recording functionality to offload the host. The two CAN channels work under sustained 100% bus load without dropping any messages. The CANflight also supports CAN listen only and loopback modes. An onboard MicroSD interface is included on each module for data acquisition storage and for module configuration information. The eXtendedCAN Tool (XCT) software is a powerfulwindow-oriented CANaerospace network toolbox for Linux, MacOS and Windows XP/7. 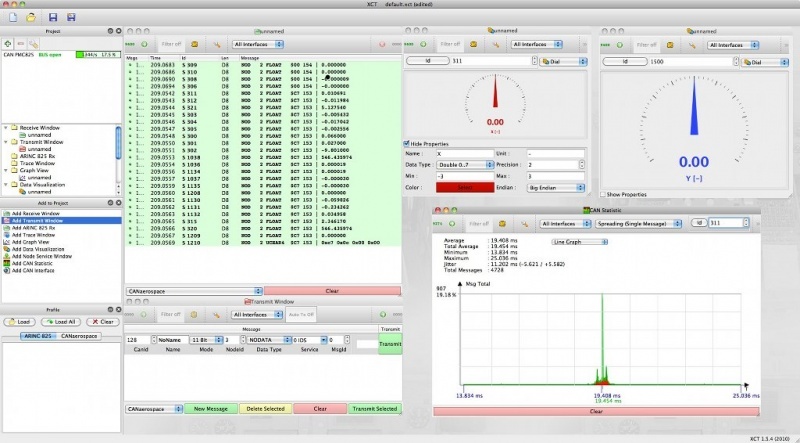 Among other features, XCT contains a CANaerospace Communication Profile reader and editor, realtime data visualization in raw and CANaerospace formats, network traffic/error statistics and an interface for CANaerospace Periodic Health Status Messages and Node Services. XCT is compliant with the CANaerospace protocol V 2.0 and supports the Rotax® 912iS data formats. XCT provides all necessary functions for CANaerospace network compatibility verification, CANaerospace end system testing, CAN network analysis, flight data recording and CANaerospace communication profile generation and analysis.